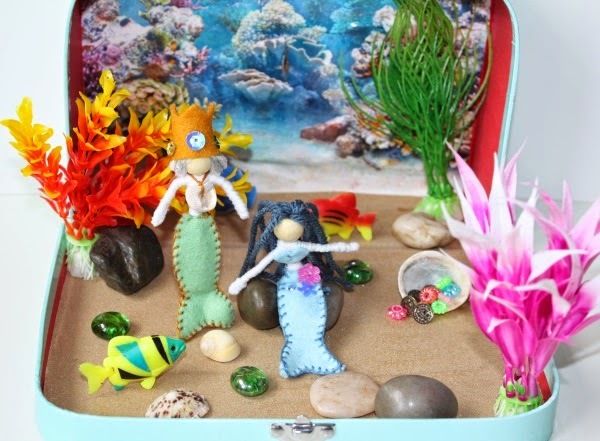 When I made my last craft project I had a brainwave and decided to use the little case as an 'underwater' home for the little Mermaid Dolls. It was really easy to put together and makes a perfect small world play set. To make it, I printed out an 'underwater' image and stuck it to the bottom of the case. Then I stuck some very fine grade sandpaper to the lid side to make a sandy sea-bed. I bought some fish tank decorations and little fish to embellish it, added stones, shells, glass beads and some 'treasure' (beads and tiny gold coins) for interest. But if you DO feel you might like a Merfolk habitat around the place, please feel free to leave a comment below and I'll choose a winner at random next Tuesday when I get back from an exciting little trip I have been looking forward to for ages. More on that soon. In the meantime, it might be a little quiet around here because I'll be busy packing suitcase(s)!! Note: This Play Set is NOT suitable for children under the age of three - because it's basically ALL small parts and therefore a bit of a scary choking hazard! It's fantastic. I loved the mermaid tutorial, and the idea of using the suitcase is inspired. This is fab so creative love mermaids. What a fantastic blog.i like your blog swindow cleaning jobstyle.